Submitted by Raphael Pulgar on Apr. 1, 2019. First published on July 6, 2016 and updated by Raphael Pulgar on April 2, 2019 with contributions by Denise Azucena. The number one barrier to entry towards having a great microphone is that most of them require an audio interface for recording. Major manufacturers now offer some of their models as USB mics with built in analog-to-digital converters to address the needs of people who simply want a good microphone with built in analog-to-digital converters to address the needs of people who simply want a good microphone for recording, streaming and podcasting. Having a USB mic opens up multiple uses mobile recording directly into a DAW as opposed to using a separate recording device and transferring files. Home recording has never been easier and with that come the rise in popularity of creating high quality audio content like musical recordings, podcasts and even film sound. Youtube, Facebook and Twitch streaming has grown increasingly popular in 2019 and the best content creators always have the best possible gear. In this 2019 update, we explore community favorites as well as great new entries into the market that replace our previous recommendations. Following in the footsteps of it's older, similarly named brother, the iCE version of the Snowball by Blue Microphones does away with the three polar pattern selector on the back of the mic and gets a fixed cardioid pattern. Because of this feature being taken out, the Snowball iCE positions itself at a more affordable price point than the previous generation. Voice recording, podcasting, conference calls, streaming. The Blue Snowball iCE features a cardioid polar pattern, tripod desktop stand and a USB Cable. The majority of users note its astounding sound quality for the price. Reviews from retail sites, community forums and Youtube channels consistently recommend it as the best value entry into high fidelity broadcast and recording. Several reviews note the stand to be flimsy. The microphone is said to be easily knocked over while on the tripod. Several have resorted to mounting it on a suspension boom stand. Pops and plosives are easily picked up at close proximity and several reviewers recommend the use of a separate pop filter. 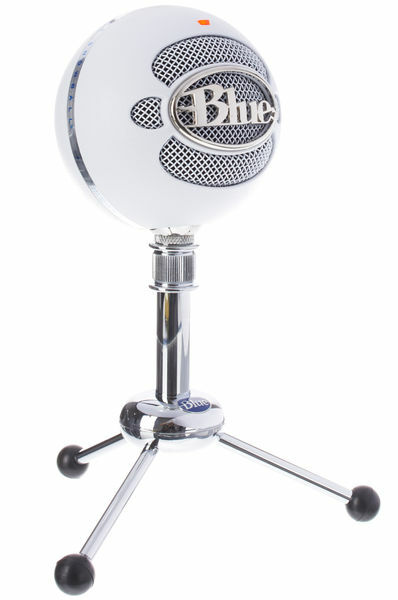 The Blue Microphones Snowball iCE is a great, affordable microphone that can definitely bring up the quality of your broadcasts and recordings. 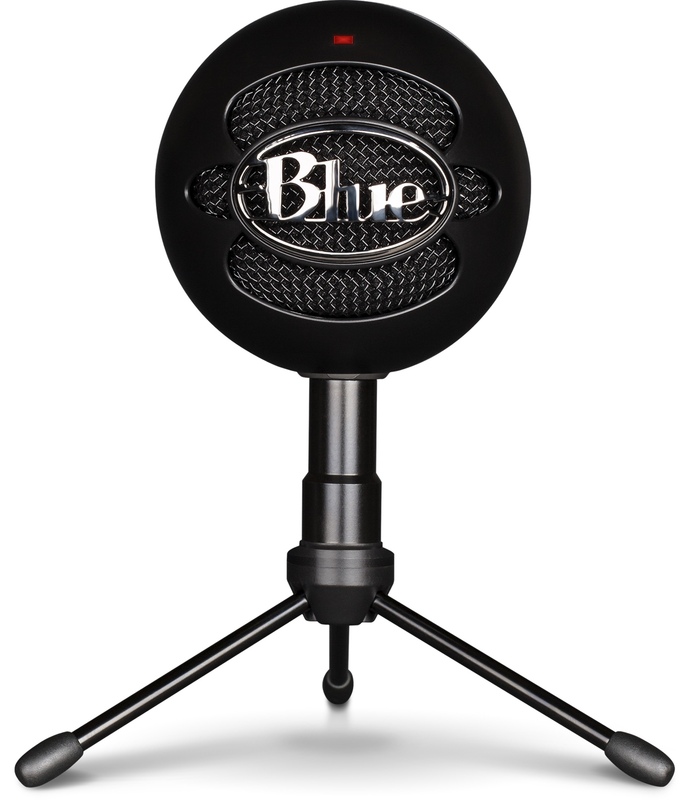 Although older than the Snowball iCE, the original Snowball is still offered by Blue Microphones as an option in their value oriented Snowball Line. It offers a switchable cardioid/omnidirectional polar pattern and a -10db pad in cardioid mode for recording louder sound sources like a bedroom jam or rudimentary guitar amplifier miking. Voice recording, instrument and amplifier recording, podcasting, conference calls, streaming. The Blue Snowball features a switchable cardioid/omnidirectional polar pattern, -10db pad on cardioid mode, tripod desktop stand and a USB Cable. Reviews for the original Snowball are generally similar with its younger iCE sibling, mainly focusing on great sound quality for the price. Some note that the -10db pad is invaluable for recording loud electric guitars through an amplifier and other high SPL sound sources like a full band rehearsing in the room. The Omnidirectional polar pattern setting also helps capture more of the room in the case of recording more than one speaker, although a little post-processing was required to bring up the gain a bit. The Snowball is easily knocked over when on it's supplied tripod desktop stand so users recommend using a scissor boom mic stand for more stability. It doesn't handle close distance plosives on its own so for users opting to speak closer to the mic, a pop filter is recommended by a few users. Some reviewers noted that the Omnidirectional polar pattern thins out their voices too much. If you require more than just speaking into a mic and would like the option to record louder sounds like a full band rehearsal or miking up a guitar cabinet, the original Snowball has the advantage of the -10db pad and omnidirectional polar pattern over its iCE sibling. The Samson Meteor Mic is a compact condenser microphone with a convenient fold-back leg design for portability. Voice recording, instrument recording, podcasting. It features a dual-chrome-played body with a fold-back leg design adjustable for ideal positioning. Its 1/8" stereo headphone jack and headphone volume provide total control when it comes to monitoring your recordings. The microphone's mute switch is a plus factor that gives you audio privacy while video conferencing. In terms of connectivity, it lets you easily connect to an iPad via Apple's Lightning USB Camera Adapter or Camera Connection Kit (30-pin). Compatible with Mac, PC computers and iPad via Apple's Lightning USB Camera Adapter or Camera Connection Kit (30-pin). Many customers said it has great audio quality. Its cardioid polar pattern picks up audio sources, such as vocals and acoustic instruments, from up front while rejecting a lot of ambient noise. It picks up quite accurate and clear sound since it has a nearly flat frequency response. Its foldable and chromed steel design makes it easy to set up, and convenient enough to carry around without worrying about damaging the unit. If your priority is being able to record on the go and need a microphone with maximum portability, the Meteor Mic is your best bet. 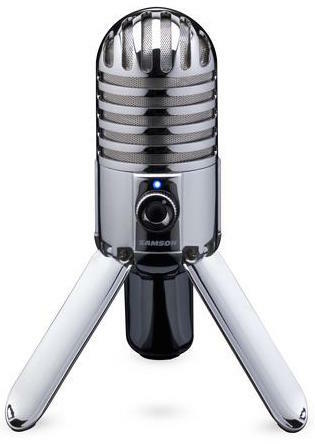 The first generation Samson C01U was the first USB condenser microphone in the market when it came out in 2005. Its successor, the C01u Pro improves upon the original platform with a dedicated headphone out for latency-free monitoring and improved signal-to-noise ratio. Voiceovers, recording music, ADR work (Automated Dialogue Replacement), sound foleys, and podcasting. Its large 19mm diaphragm captures pickup patterns and nuances. It has a 1/8" headphone jack for zero-latency monitoring, and a shock-mounted element within its metal construction for minimizing handling noise/vibrations while recording. It also includes a tripod stand and swivel mount for desktop use. Musicians, game commentators and podcasters alike praised the quality of this microphone. Most of them mentioned it reproduced clean and transparent vocal and instrument recordings. They also experienced no latency when it comes to monitoring their recordings. It is very easy to set up without any additional installations. The metal material exhibits a very sturdy construction and didn't obtain any major damage when dropped. Some users pointed out the size of the microphone limits its position and it may need to be adjusted a specific way to keep it balanced on its stand. IF you need a mid-tier microphone that doesn't need any bells and whistles but unsure about the quality of lower priced units, the Samson C01U Pro is a safe starting point. 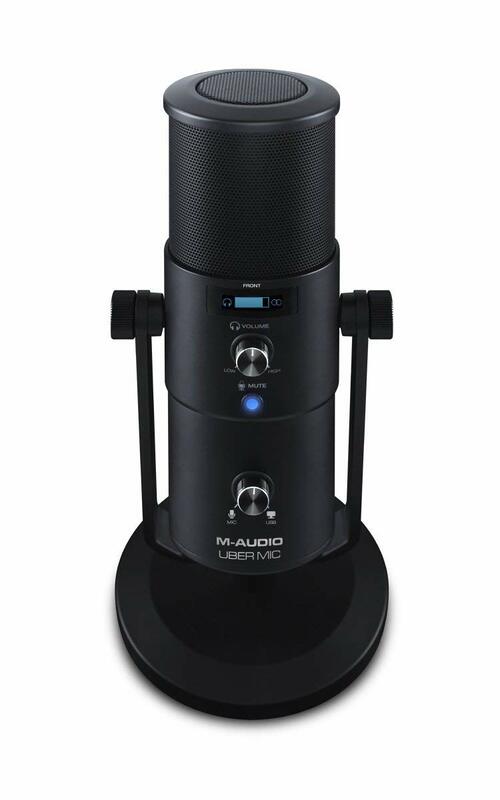 When M-Audio announced the Uber Mic in the 4th quarter of 2017, they noted that its development was borne from "Recognizing a critical need in the market for a professional-quality microphone with the performance, functional versatility and mounting options to meet any recording scenario" -- all while maintaining simplicity and ease-of-use for the general consumer. Vocal and instrument recording, broadcast, gaming, conference calls, interviews, stereo ambient/field recordings, foleys. The Uber Mic's main features include four polar patterns including stereo, zero latency monitoring, and integrated LCD screen to view settings and levels. For the price, several reviewers were happy to have a feature rich microphone with stellar audio quality and intuitive controls. Users note that the Uber Mic is more than capable of handling different usage scenarios. A forum user was hoping for iOS functionality without using the Apple iPad Camera Connection Kit. One reviewer received a unit with electrical noise. It is unclear whether the noise is from the unit or other factors. 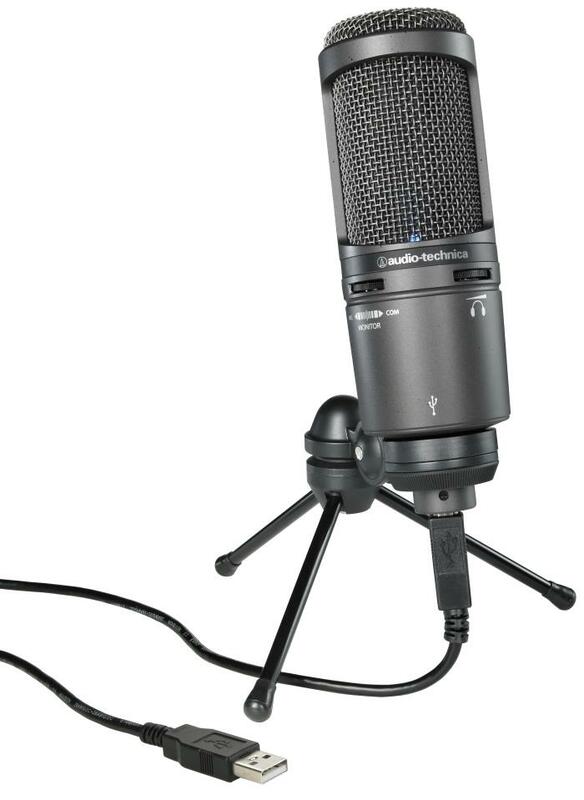 If you are a versatile content creator that does streaming/gaming, recording, podcasting, and interviews, and want a USB mic that can keep up with you, the M-Audio Uber Mic might be the jack of all trades microphone you need. 89 out of 100. Incorporating 800+ ratings and reviews. The original, xlr AT2020 mic which we featured in our guide to Condenser Mics Under $100, is a studio staple for people who need a good vocal mic for recording music while on a budget. The AT2020USB+ shares that same technology and value in a USB condenser microphone. It is used for recording music, voice-overs, and podcasting. Includes headphone jack for zero latency monitoring and comes with a desk stand, pivoting stand mount, and USB cable along with a storage pouch. The unit has both Mix and Headphone volume control. Most of the reviewers are podcasters and home recording enthusiasts that want to run a basic home studio setup without an audio interface. The Audio Technica AT2020USB+ is mentioned several times as an "upgrade" to the USB Mic they previously owned. Users found the sound to be ideal for musical recordings. Several people note that the included mic stand is flimsy and recommend other mounting options. Just like the AT2020, the AT2020USB+ has the qualities of a good vocal mic such as midrange warmth and smooth highs. The AT2020 series sounds best when used with musical recordings but podcasters, gamers and voice-over artists will be equally at home with its presentation. Perhaps the most unique feature about the Samson G-track Pro is that it isn't just a microphone. It also doubles as an audio interface with a standard 1/4" input for recording line level signals like guitar, bass, keyboard. One creative use noted on their website is patching in a mono output from a separate mixer to include a mono submix: perfect for recording additional speaking hosts, guests or instruments. Podcasting, gaming/streaming and recording music. Key features include a 1/4" instrument input for connecting guitars or line level devices, built in mixer function, selectable polar patterns and zero latency monitoring. Being able to capture 2 tracks with the line-in sound along with the mic capture is a major plus for users. This enables guitar players to use the mic as a D.I. recording solution for use with plugins inside a DAW. There have been some reports of build quality issues. Some retailers have been noted as not supplying a mount adapter. Learning curve can be challenging for having put in so many features into the product and it frustrated some users. However, those who sought help from their respective podcast/gaming communities were able to solve their problems. The unit itself, while solid and weighty, sacrifices portability. If you operate from a stationary setup and require a separate mix for line level instruments, or even a separate mixer for guests, the G-track Pro is an excellent choice. A little bit of history: The Rode company started off by modifying imported mics with premium components. Upon release, these hot rodded microphones took off "like a rat up a drainpipe" in Australian vernacular. Because of this, the mics were unofficially named the "Rodent-1" and later became the Rode NT-1 with the official stylization of the brand's "Ø" as a nod to the founder's Scandinavian lineage. The Rode NT-USB bears the NT designation for the company's flagship line of condenser microphones. This particular model was designed to address the need for a usb recording solution while maintaining the company's pedigree sound. Best used for recording vocals/singing, podcasting and voice-overs as well as recording acoustic instruments - mainly guitar. 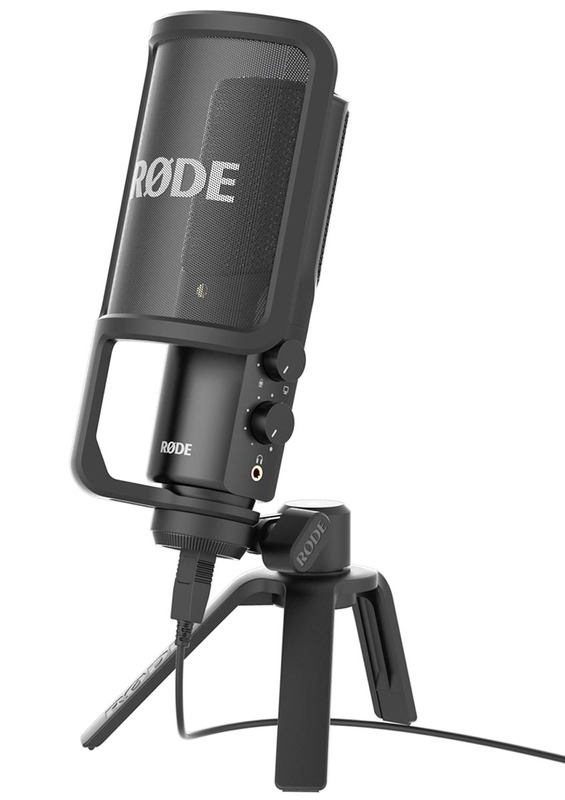 The Rode NT-USB includes a pop filter, 3.5mm headphone jack for zero latency monitoring, and has a mix knob and volume knob for monitoring adjustments. The recording quality of the NT-USB has positive reviews from musicians, podcasters and voice-over artists alike. First-time home recording enthusiasts are pleasantly surprised with how well the NT-USB handles vocal and instrument recordings. Trevor Curwen said in his Music Radar review that the NT-USB is "...your computer's perfect partner for recording vocals and acoustic instruments with minimal fuss". Some users had trouble with the gain and compatibility with Skype but upon further investigation, a specific windows 10 update at the time of the review compromised some features of USB input devices in general and has mostly been addressed as of this writing. With nearly universal praise, the Rode NT-USB is a great pick for those that just want a top quality recording microphone for vocals and instruments. 88 out of 100. Incorporating 300+ ratings and reviews. The Rode Podcaster is a USB microphone tailored for broadcast sound quality and is aimed towards people who need a voice-centric microphone. Unlike most USB Microphones which are variations of the large diaphragm condenser design, The Rode Podcaster is a Dynamic Microphone. This makes it ideal for capturing only the speaker's voice while keeping background pickup to a minimum. Primary features of the Rode Podcaster include an internal shockmount for the 28mm dynamic capsule, a 3.5mm stereo headphone output with dedicated volume control for direct monitoring. Being a dynamic mic, many reviewers with lighter voices appreciate how well the Podcaster sounds at closer mic positions benefiting from the proximity effect though an additional pop filter may be required for more plosive sounding speakers. As a microphone tuned to enhance speaking voices for broadcast, a number of users selected it for how well it represents and enhances their speaking voice. The weight and size of the unit is consistently noted by reviewers to be a problem with weaker boom arms and smaller shock mounts and recommend it best to check the dimensions first in case optional accessories will be required. Being a dynamic mic, it reacts to gain differently and may need some tweaking as noted by the variety of users saying they either have too little volume (which can be corrected by using a signal booster like the Cloudlifter CL-1) or that the mic picks up too much of the room. It was also noted to be relatively expensive. If you need a mic specifically dedicated to making broadcast quality vocals, The Rode Podcaster is a great pick for those that need that extra "radio ready" sound. The main difference, which is true of both condenser and dynamic mics, is that USB mics have a built in A/D (Audio to Digital) converter which means that you don't need an audio interface to digitize the signal from the mic. There is another important difference with condenser mics. USB condenser mics have a built in preamp that can't be bypassed. Most preamps supply phantom power to operate the mic which is usually between 12v and 48v. Because USB only provides 5v this means the mic has to be specially designed to work at this reduced voltage level. For these reasons a USB and XLR version of the same mic may sound perceptibly different - so much so that some audio engineers and home recording enthusiasts prefer not to use USB mics at all, although their numbers have declined as USB mics have improved significantly in recent times. If you are going to be recording singers or acoustic guitar then a condenser mic will give a sound that's closer to the traditional 'studio condenser mic'. Dynamic mics tend to be a little more robust and so are good for outside recording. Dynamic mics are also the type traditionally used by radio announcers and is the key to getting that polished "broadcast" sound. If you need to be able to hear what you're recording in real-time, such as when recording to backing tracks, then you will need a mic that has a headphone jack. If the mic doesn't have a headphone jack then you can only monitor by listening to the audio coming from your computer which may be slightly delayed on some systems - this is what is referred to as 'latency'. Some mics do have a headphone jack but still require you to take your monitor mix from your recording software - the IK Multimedia iRig Mic Studio is an example of that. As of the time of writing this gear guide iOS limits the current that can be provided to USB devices. This can result in a USB mic not working at all on the iPad, or more commonly the mic will work but as soon as you plug headphones in it will draw too much current and the iPad will cut the power completely. You may need to provide additional power via a Powered USB Hub in order to solve these problems. For this 2019 update we looked at all USB Mics currently available at major online stores in the USA across all price ranges. Based on their popularity and amount of reviews, we then narrowed the list down and collected information about those mics from experts, customer reviews and forum discussions. From our initial list of 35 products, we gathered over 30,800 data sources. These sources were then processed by the Gearank Algorithm to produce scores out of 100 for each USB microphone. This process enables us to choose top rated equipment based on in-depth user reviews, forum discussions and expert opinions. You can see most of the short-listed mics in our Music Gear Database. For more information about this process see How Gearank Works. Submitted by Jason Horton on Nov. 21, 2017. Submitted by Jason Horton on Apr. 2, 2019.